There is so much of it going on, I can barely stand it. This meal is my new favorite. For a variety of reasons. The first being how simple it is. The second being how it doesn’t involve turning on my stove or oven AT ALL, which is a wonderful bonus in the summer. The other reason is how freaking GOOD this tastes. It meets all my requirements: savory, a touch sweet, hearty but light, fresh, crunchy, and creamy. It’s a feast for the senses, folks. Before we get into the details, I have a small confession: I have only tasted actual chicken shawarma once. So I am totally NOT an expert on how it should taste, but I’m kinda OK with it because this recipe tastes AMAZING. Authentic or not, it’s really, really tasty. 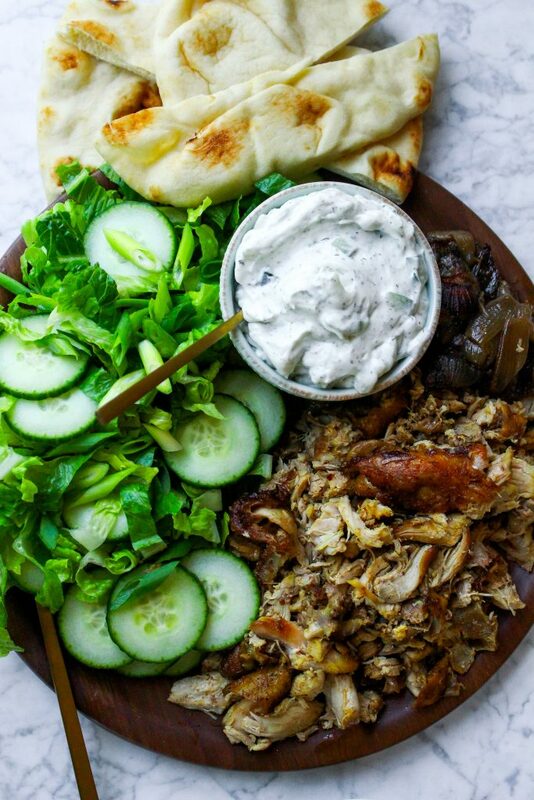 I know shawarma-style meat is supposed to be grilled or rotisserie-d for a full day or something, but I just didn’t have it in me to do things that way. I turned to my trusty slow-cooker for this one, and guess what? I have no regrets. Again, it may not be considered authentic shawarma, but I’m OK with it! The flavor totally makes up for it. Promise. OK, so let’s get into this recipe, shall we? It all starts with a delicious combo of spices. Smoked paprika, cumin, coriander, cinnamon, to name a few. They get mixed up with some chicken broth or water and fresh garlic and baste browned chicken thighs and some quartered red onions for hours. The result? The most insanely juicy and flavor-packed chicken EVER. Seriously. So. Much. Flavor. It really is crazy to me how some recipes make ordinary ingredients, like chicken thighs, taste so damn delectable. And because it all happens in the slow-cooker, you’ve got loads of time on your hands to do other things. Dinner is taking care of itself, and that is a wonderful, wonderful thing. 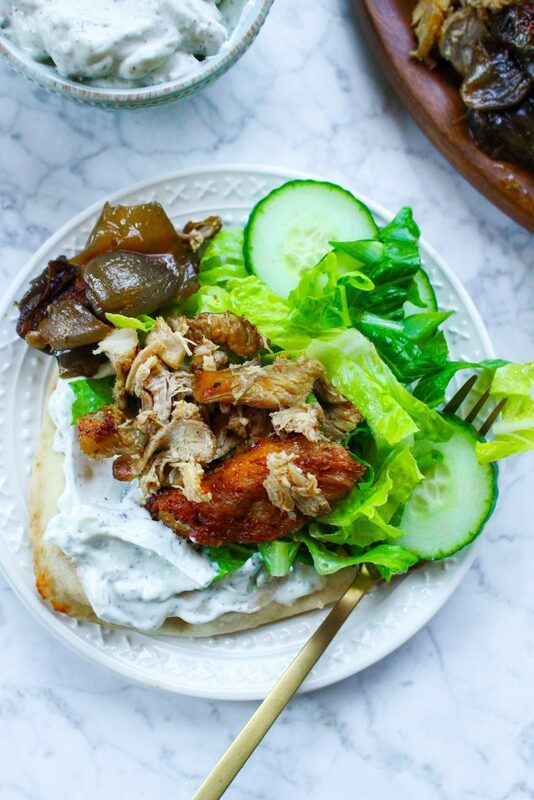 In traditional shawarma, the spiced chicken gets wrapped up with fresh ingredients, like lettuce, tomatoes, onions, and served almost gyro style. In this case, however, I’m serving it in a deconstructed style. The reason? I love a good salad on hot summer nights, and that’s exactly how this meal feels. I toss shredded romaine lettuce with the simplest of vinaigrettes and add in some crunchy cucumber, scallions, and a touch of fresh cilantro. 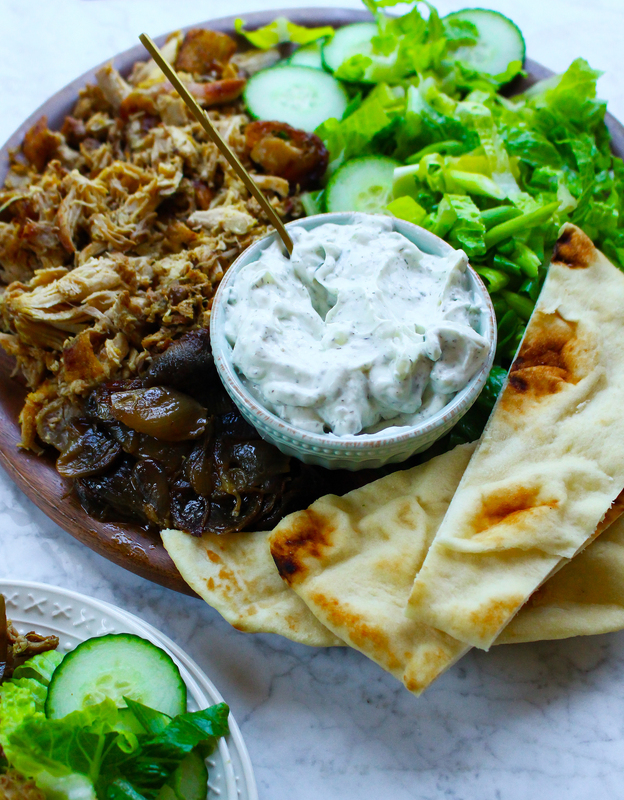 This gets piled up on a platter, alongside that insane chicken, some tzatziki, and some warmed naan bread. Then! Everyone sort of makes their own plate. 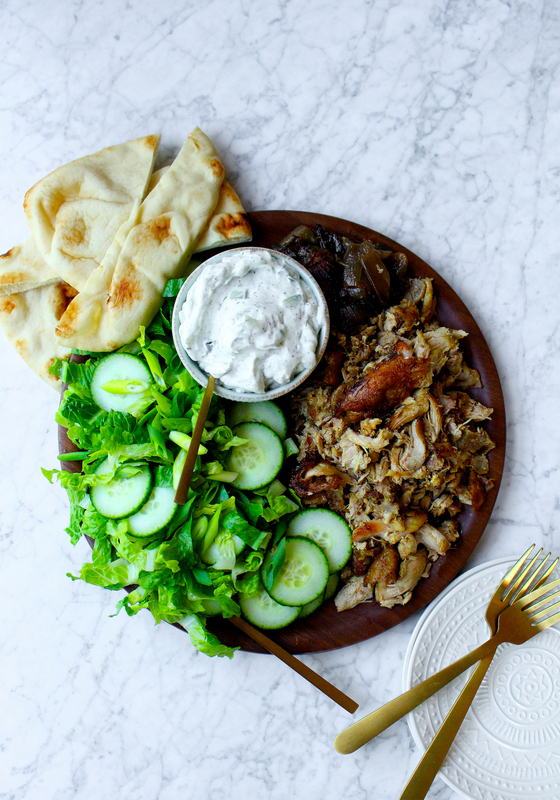 I went with a large serving of the salad, topped with the chicken, and slathered my naan with a more-than-healthy dollop of tzatziki (I could seriously LIVE off tzatziki. It is quite possibly my favorite condiment/dip of all time). There’s something so magical (yes, magical. Just go with it.) 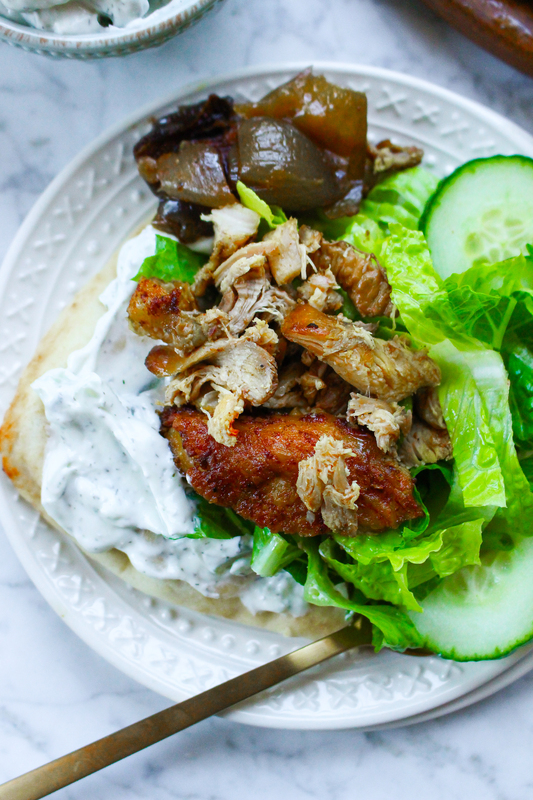 about the cool creaminess the tzatziki lends to things here. 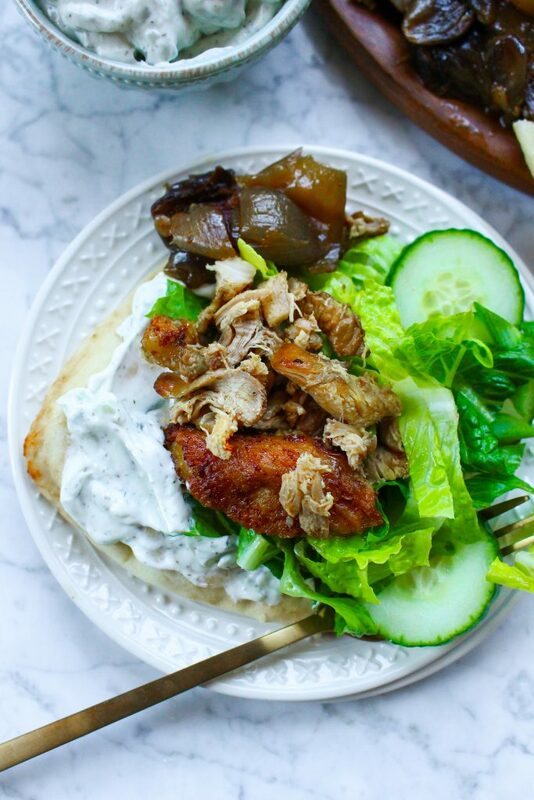 The chicken is spiced and robust, and the yogurt of the tzatziki and the fresh crunch of the salad just chill things out a bit. They keep things mellow and balanced. I love it. It’s a meal I can see us making and eating time and time again. Set your slow cooker to the “sear or brown” setting (alternatively, if your slow cooker doesn’t have this option, heat a large cast-iron skillet over medium-high heat). Add the olive oil. Season the chicken thighs with salt and pepper and add, in batches, to the slow cooker/pan. Cook until browned on both sides, about 2-3 minutes per side. 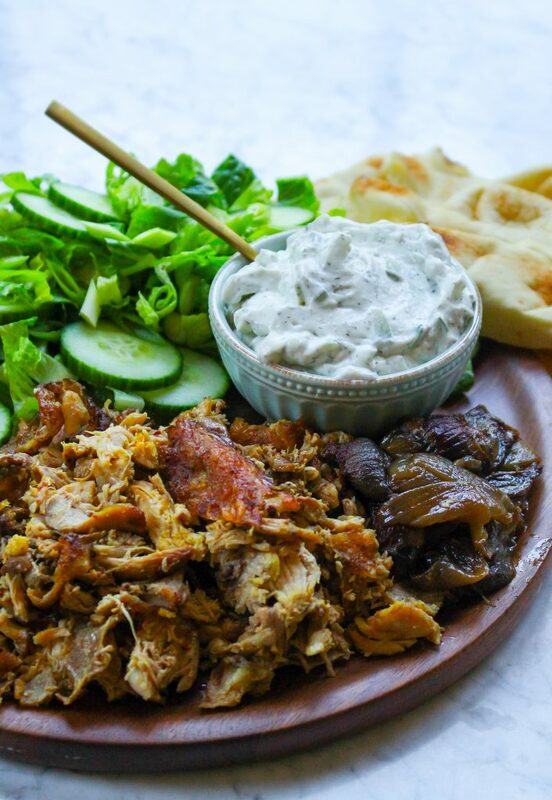 Remove the browned chicken thighs and set on a plate. Reduce the slow cooker setting to LOW (if using the pan method, still set your slow cooker to LOW now. You will not need the pan again). While the chicken is searing, whisk together the lemon juice, garlic, spices, salt, pepper, and chicken broth in a bowl. 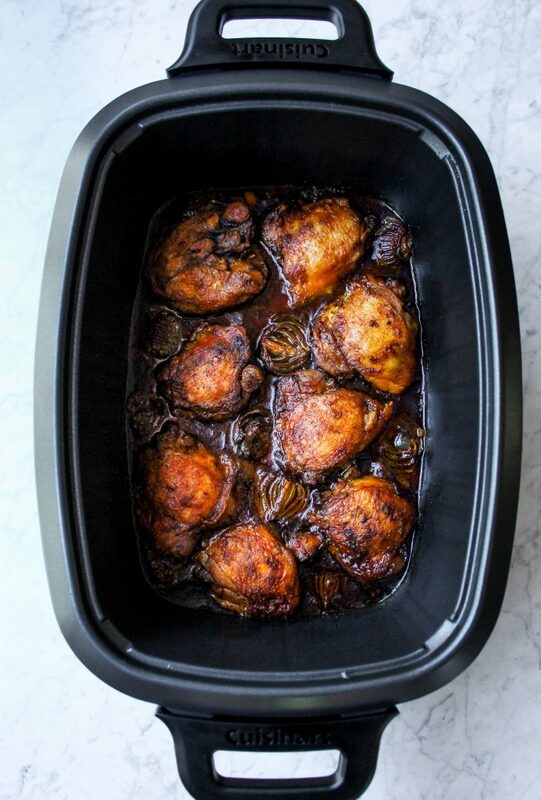 Pour the mixture into the bottom of the slow cooker and then add in the browned chicken thighs, any juices that may have accumulated on the plate, and the onion wedges. Toss to combine everything. Cover the slow cooker and cook on LOW for 6-8 hours. When you are ready to serve, shred or chop the chicken and onions. In a large bowl, whisk together the olive oil and vinegar. Season with a pinch of salt. Add the romaine, cucumber, scallions, and cilantro and gently toss until everything is lightly coated in the dressing. Transfer the salad to a large platter. 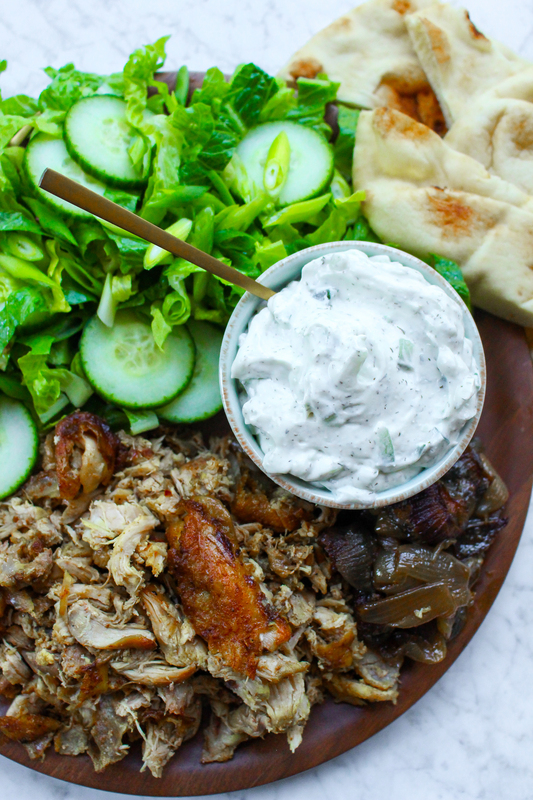 Serve the chicken and onions on the side of the salad, on the same platter, along with the tzatziki sauce and warmed pita/naan bread.